Special Features : Attention to detail is apparent in the front entrance: The scroll on the front gate is based on an illustration of a Celtic Soldier's shield. Spears, also historically based, were hand-forged in Europe. 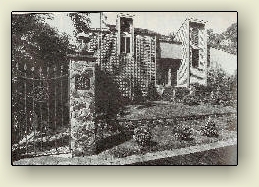 The biggest change at the front of the residence was raising the elevation 15ft and constructing veneer stone and block columns; the wrought-ironwork was custom designed by Wilt's Custom Ironwork, Knoxville MD.